Night Shift Work; Cardiovascular Diseases; Metabolic Syndrome; Risk; Jordan. Due to this epidemiological profile of the effect of night shifts on CVDs and MetS risk, it is important to conduct studies to evaluate the association between night shift work and the development of CVDs and MetS. Shedding light on this to the night shift workers population could improve their overall CVD risk management by allowing them to adopt appropriate interventions (e.g., diet, physical activity, and meditation). We previously published a study on the impact of night shift working on the level of selected lipids parameters and found that night shift workers had higher TG levels and lower HDL-C levels.18 In the same study, we used lipid parameters to calculate an index that represents insulin resistance, which was found to be significantly higher among night shift workers compared to daytime workers.19 Based on the effect of night shift working on employees’ lipid parameters, the same cohort was used in this study to examine the impact of night shift work on increasing the risk of CVDs. We used three screening methods to assess the risk of CVDs. The first method was to calculate the atherogenic index of the plasma (AIP).19 The second method was to predict the 30-year risk for CHD based on the Framingham Heart Study,20 and the third method was to assess the presence of MetS and its components using the criteria of the American Heart Association/National Heart, Lung, and Blood Institute (AHA/NHLBI).21 To the best of our knowledge, this is the first study to assess the association between night shift work and both Framingham score (30-year risk) and AIP as predictors of cardiovascular risk. This study was approved by the Institutional Review Board Committee at the Jordan University Hospital. Recruitment of subjects was conducted following the guidelines outlined in the Helsinki Declaration.22 Informed verbal consent was obtained from each participant. This study was part of a large cross-sectional study conducted to evaluate the negative consequences of working night shifts on employees’ health.18,23,24 The study sample represents a cohort of hospital employees (males and females) from all hospital departments. From this cohort, 140 apparently healthy adults (aged 20–59 years without any established CVDs at baseline evaluation), with permanent employment for at least three years were recruited. Participants were classified into two groups: daytime working group with subjects working from 7.00 am to 4.00 pm and night shift working group with subjects working from 4.00 pm to 7.00 am. The night shift working group should have at least four night shifts per month for the last three years. Exclusion criteria included pregnant female workers, part-time workers, or if daytime workers had any night shift work during their previous working schedule. Descriptive statistics were used to describe the sample; the quantitative variables were described using mean and standard deviation (SD); qualitative variables were described using frequency and percentages. Group differences were explored using independent sample t-test or one-way analysis of variance (ANOVA) for continuous variables. Non-parametric tests were used for non-normally distributed data. Categorical variables were analyzed using chi-squared analysis. If the expected frequency fell below five, Fisher’s exact test was employed. All data were entered and analyzed using SPSS Statistics (IBM Corp. Released 2010. IBM SPSS Statistics for Windows, Version 19.0. Armonk, NY: IBM Corp.). For all statistical analysis, a p-value of < 0.050 was considered statistically significant. All tests were two-tailed. There were differences in sociodemographic characteristics between the two studied groups (night shift and daytime groups) in terms of age and gender. These differences were controlled for when evaluating the difference between the two working groups. One-way analysis of covariance (ANCOVA) was used to evaluate the differences in AIP and Framingham scores between the two groups; while hierarchical multiple logistic regression was used to evaluate the difference in MetS prevalence. Finally, simple linear regression and simple logistic regression analysis were used to evaluate the influence of the duration of night shift working and the number of night shifts per month on the three cardiovascular predictors among night shift workers. Demographic and working characteristics of the study cohort are represented in Table 1. 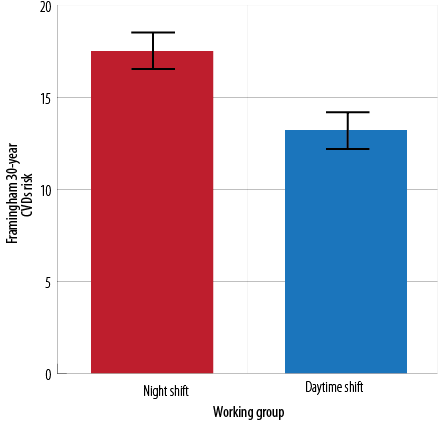 The daytime group were older and had a higher proportion of females compared to the night shift group. By conducting ANCOVA (with age and gender being the main covariates), night shift work was independently associated with increased AIP (log TG/HDL-C) compared to daytime work (0.36 vs. 0.21 respectively, F-value= 5.1, df =1, p = 0.024) [Figure 1]. Table 1: Sociodemographic and work characteristics of study sample (n = 140). *Significant at 0.050 significance level. SD: standard deviation. †Using independent sample t-test or Mann-Whitney test for continuous variables and chi-squared test for categorical variables. Figure 1: Mean value and standard error of the mean of atherogenic index of plasma (log triglyceride/high-density lipoprotein cholesterol among Jordanian employees working day or night shifts. Comparison was performed using one-way analysis of covariance (after adjusting for age and gender) (F-value = 5.1, df = 1, p = 0.024). Figure 2: Mean value and standard error of the mean of Framingham risk for cardiovascular diseases (30 years risk) among Jordanian employees working day or night shifts. Comparison was performed using one-way analysis of covariance (after adjusting for age and gender effect) (F-value = 2.5, df = 1, p = 0.115). Table 2: Anthropometric and metabolic characteristics of the day and night shift workers (n = 140 employees). BP: blood pressure; FBG: fasting blood glucose; TG: triglyceride; HDL-C: high-density lipoprotein cholesterol; MetS: metabolic syndrome. †Using independent sample t-test or Mann-Whitney test. *Significant at 0.050 significance level. Figure 3: Prevalence of MetS among Jordanian employees according to their working groups. Comparison was performed using hierarchical multiple logistic regression after adjusting for age and gender (p = 0.484). Table 3: Evaluation of the influence of night shift characteristics on the three cardiovascular parameters among night shift workers (n = 82). AIP: atherogenic index of plasma. #r: Pearson correlation obtained using simple linear regression. $OR: odds ratio obtained using binary logistic regression. In the evaluation of the 30-year risk for CVDs among the study groups, although not significant, night shift workers showed higher Framingham score compared to daytime workers (17.5 vs. 13.2, respectively, F-value = 2.5, df = 1, p = 0.115) [Figure 2]. MetS components were assessed for all participants [Table 2]. The average number of MetS components in the whole sample was 1.2, with no significant difference found between the two groups (p = 0.764). There was no significant difference between the two groups for all the anthropometric parameters except for HDL-C and TG. When evaluating the prevalence of MetS among both working groups [Figure 3], night shift workers showed a non-significant higher percentage of MetS compared to daytime workers after adjusting for age and gender confounding effect (15.9% vs. 10.3% respectively, p = 0.484). Finally, the duration of night shifts and the number of night shifts per months significantly increased the 30-year Framingham risk among night shift workers (p = 0.000 and 0.012, respectively). The presence of MetS and AIP were not affected by the duration and the number of night shifts per month [Table 3]. The relationship between the 10-year Framingham risk scoring and night shift work have been investigated in some recent studies,37–39 but this is the first study to evaluate the 30-year CVD risk. The 30-year Framingham risk scoring system estimates the risk of developing CVDs in the next 30 years.20 The fact that participants mean age in this study was 33 years led to the decision to use the 30-year risk to get a long-term prediction of risk. Although we found no significant difference in Framingham 30-year risk score between the two groups, night shift workers showed a relatively higher risk score compared to daytime workers. Among the night shift workers, 30-year Framingham risk was positively associated with an increased duration of night shift work and the number of night shifts per month. Compared to previous studies that have evaluated the 10-year risk, one study reported a higher 10-year risk score in night shift workers,39 while others reported no significant difference among night shift workers compared to daytime workers.37,38 The advantage of the simple equation used in this study is the lack of need for laboratory values; it is only based on standard risk factors. This means CHD risk assessment can be easily implemented in primary care settings. Although numerous researchers have suggested an association between night shift work and MetS,3,13,27-30 we did not find this association significant. 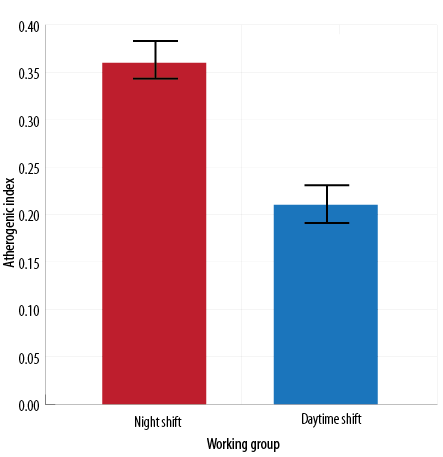 However, a higher percentage of night shift workers developed MetS compared to daytime workers. A possible justification for the lack of a significant relationship is the relatively small sample size, which may affect the power of the study. Variation in eating habits between night shift and daytime workers may explain part of the observed association with FBG and abdominal obesity in these previous studies.3,28,41 Night shift workers were reported to consume more food during the night and more smaller meals throughout the day compared with daytime workers. This may contribute to desynchronization of the rhythmicity of glucose and TG, which consequently, may result in more hyperglycemia and abdominal fat deposits.43 We did not assess the dietary habits of the two working group, so it is difficult to explain the insignificant variations in FBG and abdominal obesity between them. It is important to mention that this study has some methodological limitations. First, the study was limited by its cross-sectional design, which does not infer a causal relationship between increased cardiovascular risk and shift work. Second, the relatively small recruited sample size may reduce the power of the study to identify significant differences between the groups. The reason behind this limited sample size is the strict inclusion criteria for subject recruitment and the fasting requirements to obtain blood samples, which proved to be challenging to employees. Third, in this study, no data about dietary habits of the recruited participants was collected, which may confound the results obtained in this study. This is the first study to assess the association between night shift work and AIP as well as the 30-year Framingham risk score as a predictor of CVDs. Night shift work was associated with an increase in AIP score compared to daytime work. The duration of night shift working and the number of night shifts per month significantly increased the 30-year Framingham risk among night shift workers. These findings suggest an association between night shift work and the risk of CVDs and atherosclerosis. Therefore, it is warranted to monitor shift workers clinical parameters and lifestyle habits. Further studies are needed to investigate the effect of longitudinal exposure to night shift work on CVD risk and the development of MetS, and how lifestyle intervention can ameliorate CVD progression. The authors declared no conflicts of interest. This study was funded by the Deanship of Scientific Research at The University of Jordan (Grant No. 68/2013-2014). 1. Pagidipati NJ, Gaziano TA. Estimating deaths from cardiovascular disease: a review of global methodologies of mortality measurement. Circulation 2013 Feb;127(6):749-756. 2. Daviglus ML, Talavera GA, Avilés-Santa ML, Allison M, Cai J, Criqui MH, et al. Prevalence of major cardiovascular risk factors and cardiovascular diseases among Hispanic/Latino individuals of diverse backgrounds in the United States. JAMA 2012 Nov;308(17):1775-1784. 3. Esquirol Y, Perret B, Ruidavets JB, Marquie JC, Dienne E, Niezborala M, et al. Shift work and cardiovascular risk factors: new knowledge from the past decade. Arch Cardiovasc Dis 2011 Dec;104(12):636-668. 4. Bixler E. Sleep and society: an epidemiological perspective. Sleep Med 2009 Sep;10(Suppl 1):S3-S6. 5. Tepas DI. Do eating and drinking habits interact with work schedule variables? Work Stress 1990;4(3):203-211. 6. Bass J, Takahashi JS. Circadian integration of metabolism and energetics. Science 2010 Dec;330(6009):1349-1354. 7. Karlsson B, Knutsson A, Lindahl B. Is there an association between shift work and having a metabolic syndrome? Results from a population based study of 27,485 people. Occup Environ Med 2001 Nov;58(11):747-752. 8. Kroenke CH, Spiegelman D, Manson J, Schernhammer ES, Colditz GA, Kawachi I. Work characteristics and incidence of type 2 diabetes in women. Am J Epidemiol 2007 Jan;165(2):175-183. 9. Leproult R, Holmbäck U, Van Cauter E. Circadian misalignment augments markers of insulin resistance and inflammation, independently of sleep loss. Diabetes 2014 Jun;63(6):1860-1869. 10. Morikawa Y, Nakagawa H, Miura K, Soyama Y, Ishizaki M, Kido T, et al. Effect of shift work on body mass index and metabolic parameters. Scand J Work Environ Health 2007 Feb;33(1):45-50. 11. Scheer FA, Hilton MF, Mantzoros CS, Shea SA. Adverse metabolic and cardiovascular consequences of circadian misalignment. Proc Natl Acad Sci U S A 2009 Mar;106(11):4453-4458. 12. Tüchsen F, Hannerz H, Burr H. A 12 year prospective study of circulatory disease among Danish shift workers. Occup Environ Med 2006 Jul;63(7):451-455. 13. Wang F, Zhang L, Zhang Y, Zhang B, He Y, Xie S, et al. Meta-analysis on night shift work and risk of metabolic syndrome. Obes Rev 2014 Sep;15(9):709-720. 14. Bøggild H, Knutsson A. Shift work, risk factors and cardiovascular disease. Scand J Work Environ Health 1999 Apr;25(2):85-99. 15. Frost P, Kolstad HA, Bonde JP. Shift work and the risk of ischemic heart disease - a systematic review of the epidemiologic evidence. Scand J Work Environ Health 2009 May;35(3):163-179. 16. Vyas MV, Garg AX, Iansavichus AV, Costella J, Donner A, Laugsand LE, et al. Shift work and vascular events: systematic review and meta-analysis. BMJ 2012 Jul;345:e4800. 17. Hanley AJ, Karter AJ, Williams K, Festa A, D’Agostino RB Jr, Wagenknecht LE, et al. Prediction of type 2 diabetes mellitus with alternative definitions of the metabolic syndrome: the Insulin Resistance Atherosclerosis Study. Circulation 2005 Dec;112(24):3713-3721. 18. Alefishat E, Abu Farha R. Is Shift Work Associated with Lipid Disturbances and Increased Insulin Resistance? Metab Syndr Relat Disord 2015 Nov;13(9):400-405. 19. Dobiásová M. Atherogenic index of plasma [log(triglycerides/HDL-cholesterol)]: theoretical and practical implications. Clin Chem 2004 Jul;50(7):1113-1115. 20. Pencina MJ, D’Agostino RB Sr, Larson MG, Massaro JM, Vasan RS. Predicting the 30-year risk of cardiovascular disease: the framingham heart study. Circulation 2009 Jun;119(24):3078-3084. 21. Grundy SM, Cleeman JI, Daniels SR, Donato KA, Eckel RH, Franklin BA, et al; American Heart Association; National Heart, Lung, and Blood Institute. Diagnosis and management of the metabolic syndrome: an American Heart Association/National Heart, Lung, and Blood Institute Scientific Statement. Circulation 2005 Oct;112(17):2735-2752. 22. World Medical A; World Medical Association. World Medical Association Declaration of Helsinki: ethical principles for medical research involving human subjects. JAMA 2013 Nov;310(20):2191-2194. 23. Alefishat E, Abu Farha R. Determinants of vitamin d status among Jordanian employees: Focus on the night shift effect. Int J Occup Med Environ Health 2016;29(5):859-870. 24. Akour A, Abu Farha R, Alefishat E, Kasabri V, Bulatova N, Naffa R. Insulin resistance and levels of cardiovascular biomarkers in night-shift workers. Sleep Biol Rhythms 2017;15(4):283-290. 25. Dobiásová M, Frohlich J. The plasma parameter log (TG/HDL-C) as an atherogenic index: correlation with lipoprotein particle size and esterification rate in apoB-lipoprotein-depleted plasma (FER(HDL)). Clin Biochem 2001 Oct;34(7):583-588. 26. Rader DJ, Hovingh GK. HDL and cardiovascular disease. Lancet 2014 Aug;384(9943):618-625. 27. Guo Y, Rong Y, Huang X, Lai H, Luo X, Zhang Z, et al. Shift work and the relationship with metabolic syndrome in Chinese aged workers. PLoS One 2015 Mar;10(3):e0120632. 28. De Bacquer D, Van Risseghem M, Clays E, Kittel F, De Backer G, Braeckman L. Rotating shift work and the metabolic syndrome: a prospective study. Int J Epidemiol 2009 Jun;38(3):848-854. 29. Pietroiusti A, Neri A, Somma G, Coppeta L, Iavicoli I, Bergamaschi A, et al. 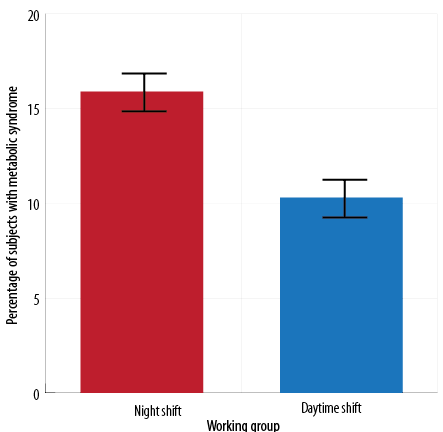 Incidence of metabolic syndrome among night-shift healthcare workers. Occup Environ Med 2010 Jan;67(1):54-57. 30. Lin Y-C, Hsiao T-J, Chen P-C. Persistent rotating shift-work exposure accelerates development of metabolic syndrome among middle-aged female employees: a five-year follow-up. Chronobiol Int 2009 May;26(4):740-755. 31. Niroumand S, Khajedaluee M, Khadem-Rezaiyan M, Abrishami M, Juya M, Khodaee G, et al. Atherogenic Index of Plasma (AIP): A marker of cardiovascular disease. Med J Islam Repub Iran 2015 Jul;29:240. 32. Khazaál MS. Atherogenic Index of Plasma (AIP) as a parameter in predicting cardiovascular risk in males compared to the conventional dyslipidemic indices (cholesterol ratios). Karbala J. Med 2013;6(1):1506-1511. 33. Nwagha UI, Ikekpeazu EJ, Ejezie FE, Neboh EE, Maduka IC. Atherogenic index of plasma as useful predictor of cardiovascular risk among postmenopausal women in Enugu, Nigeria. Afr Health Sci 2010 Sep;10(3):248-252. 34. Hemamalini RV, Priyadarshini A, Saravanan A. Effect of shift work on risk factors of cardiovascular diseases. IJCRR 2013;5(22):39-45. 35. Hemann BA, Bimson WF, Taylor AJ. The Framingham Risk Score: an appraisal of its benefits and limitations. Am Heart Hosp J 2007;5(2):91-96. 36. Khalili D, Hadaegh F, Soori H, Steyerberg EW, Bozorgmanesh M, Azizi F. Clinical usefulness of the Framingham cardiovascular risk profile beyond its statistical performance: the Tehran Lipid and Glucose Study. Am J Epidemiol 2012 Aug;176(3):177-186. 37. Asare-Anane H, Abdul-Latif A, Ofori EK, Abdul-Rahman M, Amanquah SD. Shift work and the risk of cardiovascular disease among workers in cocoa processing company, Tema. BMC Res Notes 2015 Dec;8:798. 38. Esquirol Y, Bongard V, Mabile L, Jonnier B, Soulat JM, Perret B. Shift work and metabolic syndrome: respective impacts of job strain, physical activity, and dietary rhythms. Chronobiol Int 2009 Apr;26(3):544-559. 39. Pimenta AM, Kac G, Souza RR, Ferreira LM, Silqueira SM. Night-shift work and cardiovascular risk among employees of a public university. Rev Assoc Med Bras (1992) 2012 Mar-Apr;58(2):168-177. 40. Sowers JR, Epstein M, Frohlich ED. Diabetes, hypertension, and cardiovascular disease: an update. Hypertension 2001 Apr;37(4):1053-1059. 41. Karlsson BH, Knutsson AK, Lindahl BO, Alfredsson LS. Metabolic disturbances in male workers with rotating three-shift work. Results of the WOLF study. Int Arch Occup Environ Health 2003 Jul;76(6):424-430. 42. Giles TD. Circadian rhythm of blood pressure and the relation to cardiovascular events. J Hypertens Suppl 2006 Apr;24(2):S11-S16. 43. Canuto R, Garcez AS, Olinto MT. Metabolic syndrome and shift work: a systematic review. Sleep Med Rev 2013 Dec;17(6):425-431.